We’ve been fighting colds all week, so I made a pot of THM-friendly Chicken Soup to help kick the bug while staying on plan. This soup is an E because of the higher carb count in the carrots and onions. If you’re only having a small amount, you can consider this a Fuel Pull. Chicken breasts provide a lean source of protein. I like to throw them in the pot and shred the chicken with a fork after its been cooked, but you can also cut the breasts into chunks before cooking if you prefer. Own this soup by adjusting the herb measurements to your liking. A lightly buttered (no more than a teaspoon) slice of Gwen’s E bread makes a delicious dipper! 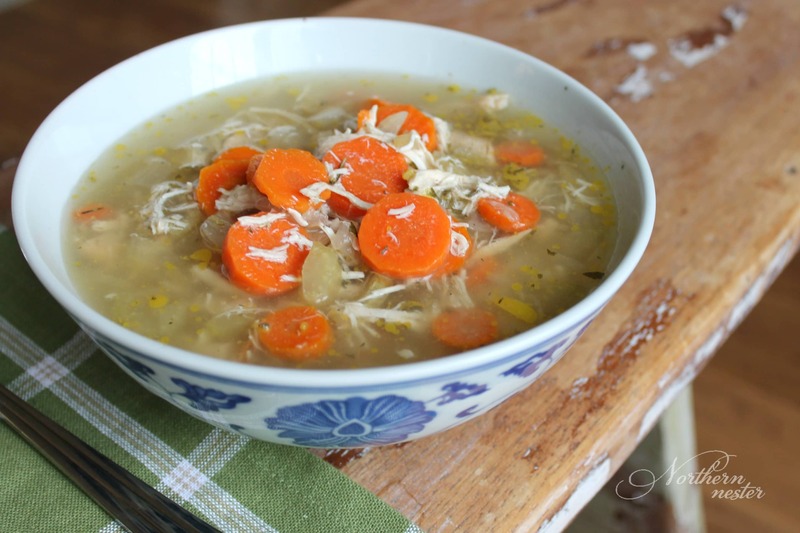 Help kick the cold and flu bug while staying on plan with this tasty THM-friendly Chicken Soup! A THM E.
Add all ingredients except for broth and water to a large pot. Saute together until onions are translucent and chicken is mostly cooked through. Pour in broth and water. Boil for 20 minutes. Turn heat to low and simmer for an hour or longer, if you'd like. Remove chicken breasts when cooked through and shred them with a fork before returning to pot. It’s not called “Jewish penicillin” for nothing! Although I think you really need to start with an entire chicken for tbe full effect. Get well soon. Can I add brown rice to this recipe and it still be an E? If so, how much? Thank you!